West Seattle resident and art therapist Jennifer Harkness is offering workshops to help cope with holiday-producing anxiety. 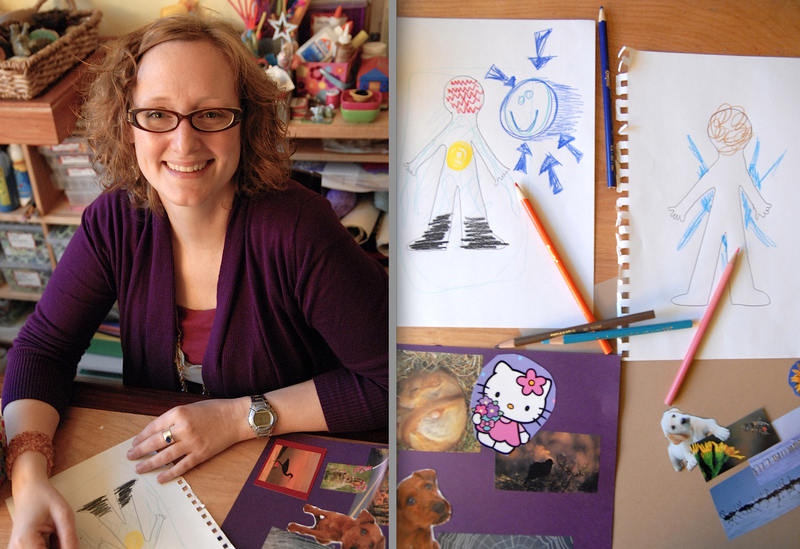 In addition to talk-therapy, she utilizes art supplies, and diagrams of people, to assist clients to unmask emotions in a non-threatening way. And if you feel you can't draw well, you can always use collage. Through her practice Courageous Heart Healing, LLC, child, adult, family and group psychotherapist Jennifer Harkness combines traditional talk-therapy techniques with meditation and art. In a previous West Seattle Herald article, she told us, "My studio is full of yummy supplies, chalk, pastels, oil pastels, clay, glitter glue, boxes, canvas." The West Seattle resident continues to practice in the Activspace building, 3400 Harbor Ave SW, but after a year is expanding to a larger space there to better serve families and larger groups. She said she is busiest during the holiday season, which is quickly approaching. More clients come to her to address internal tumult resulting from heightened expectations of holiday happiness, and the sometimes pesky business of stirring up old emotions when gathering with family. She is offering workshops beginning in November, including "Revising your Relationship with the Holidays through Creative Process", "Understanding my Different Homes during the Holidays for kids and teens", as well as the intriguing "Learning Media Literacy and Creating Healthy Self and Body Image through Art for Young Women", where, she explains on her website, "We live in an age of impossibly thin expectations, leaving little room for our many different body types. It is overwhelming to say the least." "I've been in mental health for years and this is always my busy time of year, where people's issues are heightened," she said. "My holiday workshops are a great and affordable way to gain insight and coping skills around the holidays for adults who struggle emotionally this time of year and for children and teens who have complicated family dynamics and multiple households. There is this expectation in our culture that in every single home people will feel loved, have fun, and enjoy lots of presents and food during the holidays. A lot of people love their families, but don't like them very much." Holidays also present emotional challenges because of family we loved and did like, but lost. "For those who have lost loved ones, holidays are going to renew grief," she said. "It's also during winter. It's getting dark. We start to think internally about what's going on. "Little kids I work with, if they have tension at home, when the holiday (school) break comes and they have to spend two or three weeks with family, that can be really hard for them, and for their parents," she added. "With divorce, lots of kids have to go back and forth between homes. Maybe one house is, 'Yay! This is fun.' And the other home is like, 'This is torture.' It can be really complicated." So how can coloring with crayons cure our ills and help us get through the turkey dinner when Dad is being a grinch and your big sister you seldom see, in from Toledo, reminds you, and the other dinner guests, that you placed last in your fifth grade spelling bee? "My intension is to give people a space to explore that and to find their real needs," she said as she presents a sheet of paper with a basic diagram, just a black outline of a human figure, and a basket of color pencils and markers. This is just one of many visual tools she uses. She said that, once her client is equipped with the diagram, the human outline, and pencils, her dialogue may begin with, "I want you to think about the holidays for yourself, to picture how you feel during the holidays, and I'll do it too so you don't feel alone." She begins to draw on her own diagram. She said, "I feel real heavy, and it's kind of dark in here," and scribbles black pencil on both of the figure's feet. "I feel like I am supposed to feel happy, and when I don't, I feel swirly in my stomach and hot." She fills the figure's stomach with yellow in a circular motion. She continued, "I have a lot of thoughts during the holidays and my mind is really busy." She covers the head with abrupt, red waves. "If this figure could speak, what would it say? What would it need? With drawing I get passed some people's defenses a lot faster than with just talk-therapy. Therapy is about acknowledging what's sad, and what's going well. A lot of people feel they have to draw a box around this (human outline) and put a happy face on top. "Self-compassion and compassion for others are probably some of the most healing properties on the planet," she said. "There is neurobiology behind it. A lot of us have a strong inner critic, and having self-compassion is an antidote to the inner critic. Also, compassion is not just soft and mushy, it can be a boundary. If a kid comes in here and is breaking things, about to hurt himself, I'm going to be like, 'Wow, OK. you're really angry. I really see that.' That's the empathy part of compassion. Then I'm going to say, 'And you need to stop.' That's the boundary part. I don't want him to hurt himself." Harkness believes kids are over-diagnosed and over-medicated due in part to our fast-paced culture. She explained, "Kids are overstimulated. It's hard for their nervous systems to keep up with it. They don't have enough free time just to play and be kids. Parents are so busy they are not having the time to invest in the relationship with their kids, and relationship is a way to sooth the nervous system and to help build healthy coping systems. It's not blame for the parents or kids, it is just the culture we live in. "I think we do try to give kids labels and pills to try to fix them. I find that relationship, time, compassion and new coping skills can do wonders, she said. "I see that over and over in my office. I say to parents, 'Schedule an unstructured play date with your kids.' I ask, 'When was the last time your kids had nothing scheduled the whole day and could just play?' It's sad. As a goal driven, money driven culture we've lost that." She emphasized that the holidays needn't be gloomy, even as we may get emotionally prodded. She said, "I may be a successful, productive adult but become an angry teenager during Christmas and wonder, 'Why am I screaming at my mom?" Old patterns come up. But you can shift things. You can change. I don't put down all American culture. We have the freedom to create. If I have a passion in my life, it's creativity and connection. I watch people blossom and open through the creative process." For class information, visit her website here, and click on "Groups and Workshops", or phone her at (541) 517-6222.